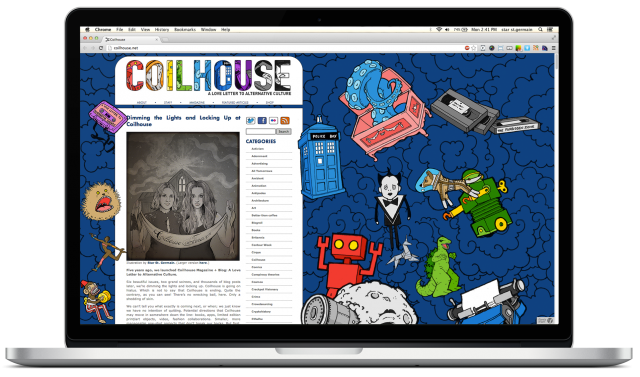 Back in November, I had the honor of working on the hiatus redesign of Coilhouse.net. I also did the illustration on their goodbye post. Back then, I promised you I’d make a more proper post about the redesign, so here it is! My dear friend Nadya Lev had been designing the site, and ended up initially asking me to provide some CSS wizardry. 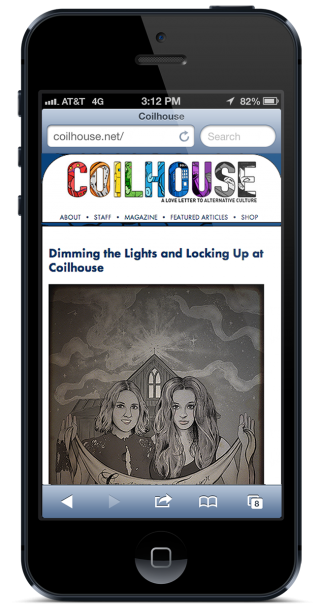 It was to be the last hoorah for this much celebrated magazine and blog, before it went dark for a few years. Even though I started just doing fill in CSS work, I ended up being development lead and also helping Nadya with a bunch of the design decisions. The site was particularly challenging because it had originally been designed to be quite narrow, and all the images in the archive were less than 400px wide! I was concerned that such a narrow layout would make the site look dated, even though we’d just redesigned. However, going through and upsizing the content wasn’t an option. Nadya had wanted to fill all the horizontal space with illustrations she had comissioned from the awesomely talented Jason Levesque. She had thought she would just set them as a background image- but at some point the topic of parallax scrolling came up. Normally I wouldn’t go for something this busy for a content site like this, but since it would no longer be updating- a fun approach like this seemed appropriate. We ended up putting the whole menagerie of tiny illustrations into a parallax scrolling, easter egg filled layout. This solved most of my concerns about the site looking dated, as this animation technique has only recently seen a rise in popularity. We spent hours and ours placing every illustration manually, choosing the speed it should scroll at, and making certain characters interact with others in particular ways as you scroll. As much as I advocate for responsive design, with a content width as small as it is, we decided to just make a standard view and a mobile view instead of the usual full range of responsive breakpoints. I’d love to go back in and optimize for a better tablet experience at some point. Perhaps when they decide to return to the site and come out of hiatus, I’ll come back to help come up with a new theme for relaunch. Until then, enjoy clicking around on the illustrations, and reading the massive archive of content from the past several years. While I am sad that there’s no new activity over there- I’m overjoyed that my friends who worked on it can now take the time to pursue other things that they love. I’ll be here when you wake up.